In September, I will be turning sixty, and with milestone events, it is our custom to celebrate early and often. Therefore, as a kickoff for my birthday, Clif and I went with our friends Lyn and Stephen to one of the most delightful shows I have ever had the pleasure of attending—Circus Smirkus, a youth circus featuring jugglers, acrobats, contortionists, clowns, tightrope walkers, and anything else associated with the big top. (Except animals, and for that I am grateful.) 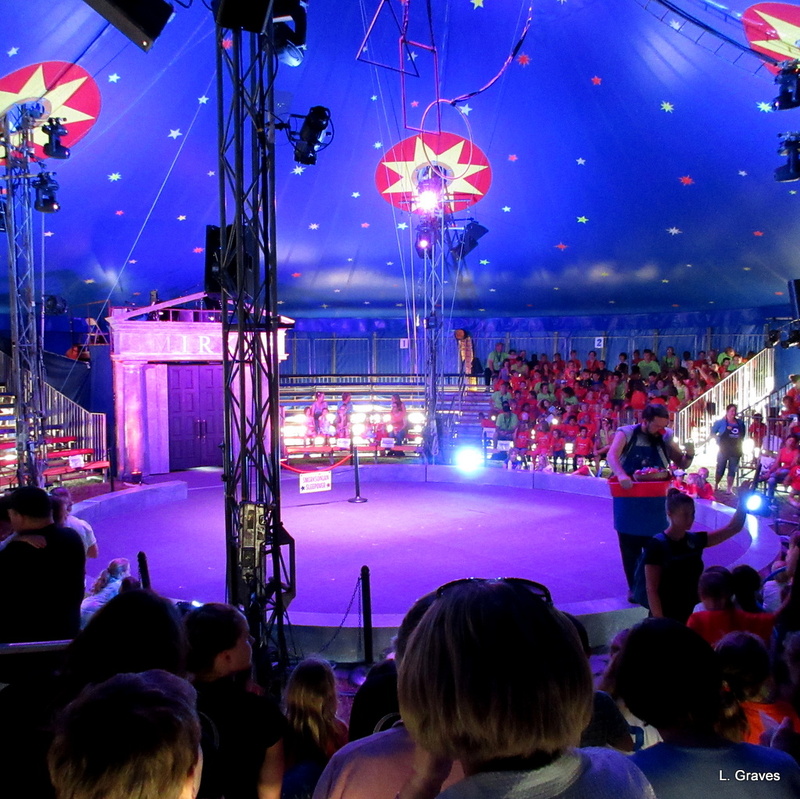 On Monday, Circus Smirkus was performing in Freeport, about forty miles from where we live. Circus Smirkus is based in Greensboro, Vermont, and as noted in their booklet, it is “a nonprofit arts education organization whose mission is to promote the skills, culture, and traditions of the traveling circus, and to inspire youth to engage in life-enhancing adventures in the circus arts.” Kids go to Smirkus camp and audition for a part in the Big Top Tour, which runs from July through August. 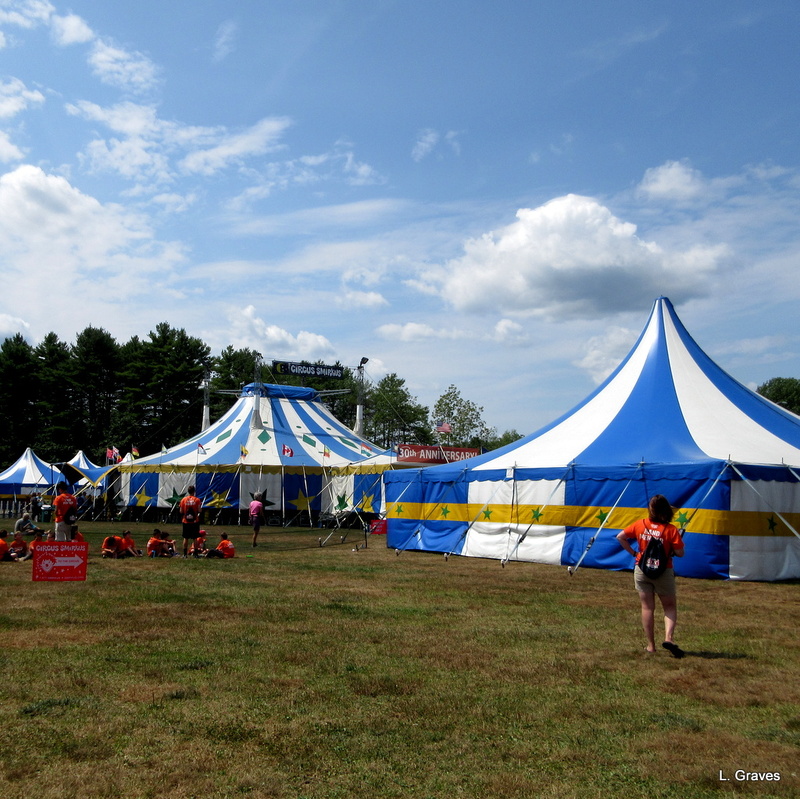 If Circus Smirkus ever comes to a town near you, don’t hesitate. Go see this extraordinarily talented and energetic circus troupe of youthful performers ranging in age from twelve to eighteen. 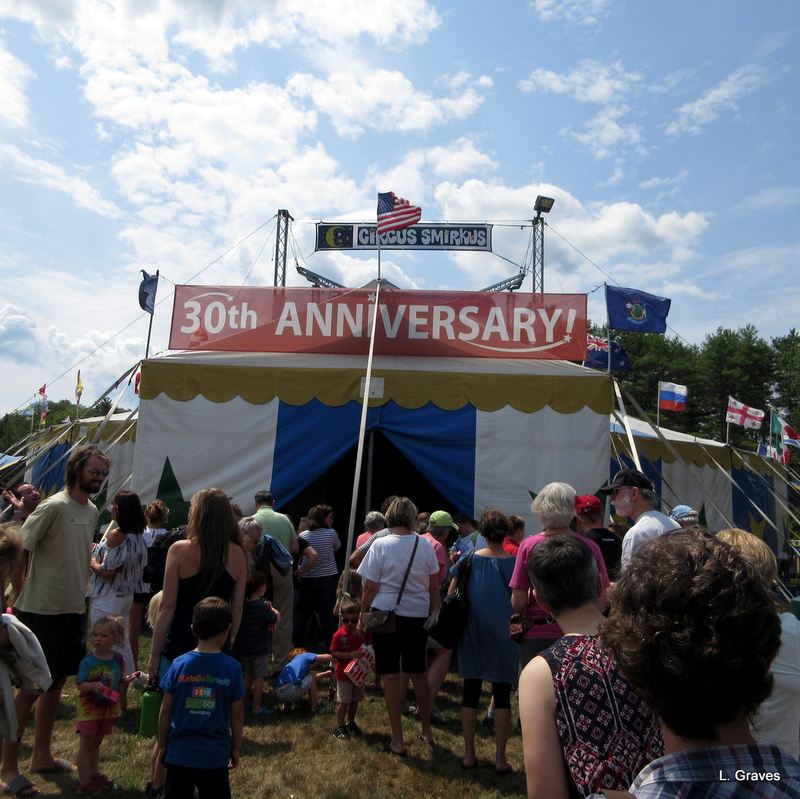 For me, the thrill started as soon as we had parked, and I caught a glimpse of the big circus tent, which transported me to the days of my own youth and the magic of fairs and circuses. It didn’t hurt that the tents featured my favorite color—blue. Inside, the tent was a glorious night-time blue, and we got seats high in the back, which gave us a terrific view of the ring. The theme of this year’s show is Midnight at the Museum, where a mischievous young boy unlocks the museum doors at night and lets loose various “exhibits,” which gives the young performers ample opportunity to strut their stuff. And strut it they did in a series of jaw-dropping pieces. 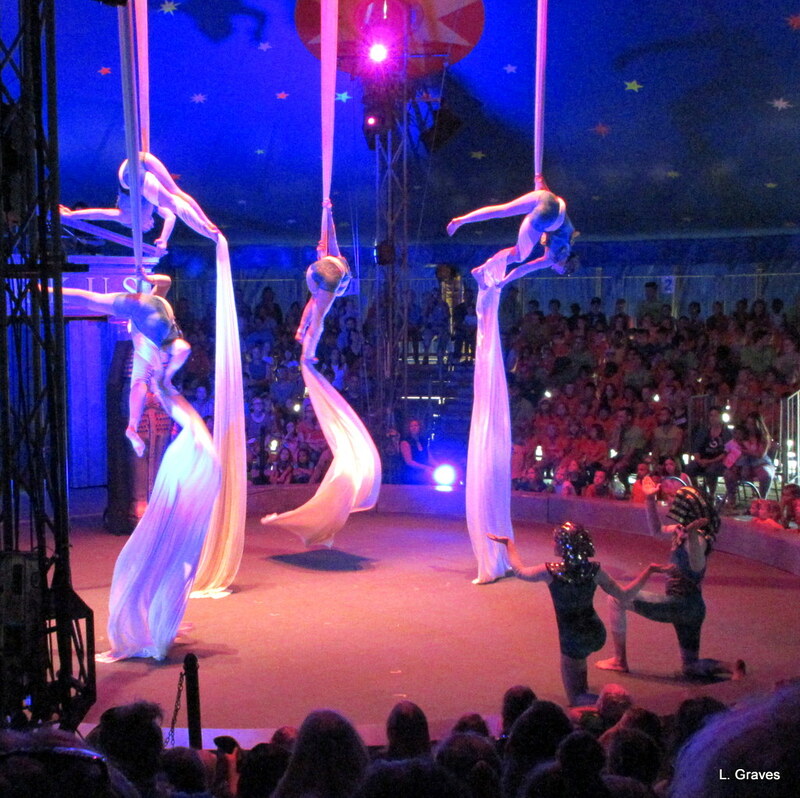 Over and over, as performers whirled, stretched, spun, walked on the tightrope, and did other amazing things, we said in astonishment, “Oh, my gosh! How do they do that?” In one piece, young girls as octopuses stretched and twisted their legs in ways I didn’t think was humanly possible. In another piece, featuring explorers from the South Pole, young performers zipped up and down the “South Pole” at breakneck speed, stopping just short of hitting the floor. Two young girls on the trapeze showed not only great strength and agility but also great trust in each other. One wrong move, and down to the floor they would have crashed. Here are a couple of pictures from the show. These photos only give the dimmest impression of what we saw and don’t really convey the energy and vitality of the kids. Two other things of note: There was live music, where the musicians reacted to what was happening in the ring, and the whole show had very nice pacing, with acrobats followed by clowning followed by jugglers. After the show, we all went to Gritty’s in Freeport, and we marveled over what we had just seen—the skill, the energy, and the talent of these young performers. 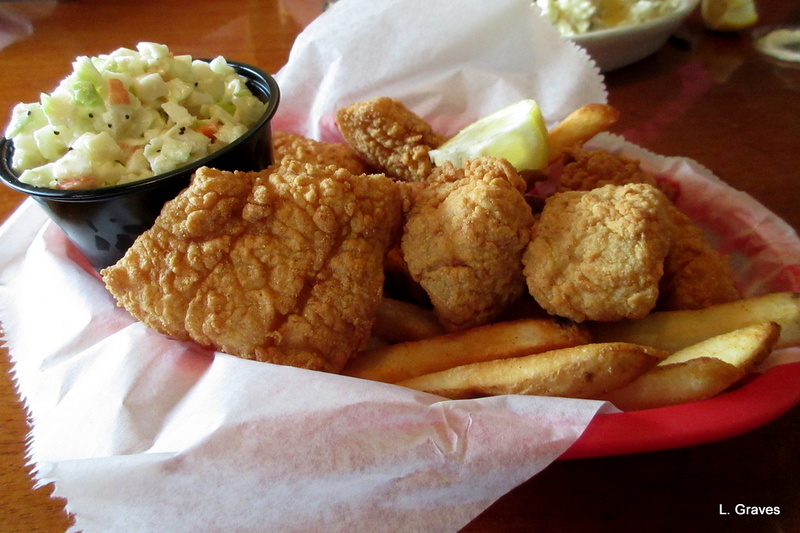 I had one of my favorites—fish and chips—and it was very good indeed. Lyn and Stephen have seen Circus Smirkus many times, but this was a first for Clif and me. Even though I won’t have the excuse of a milestone birthday, Clif and I decided this should be an annual event, where we get together with Lyn and Stephen for the snappy Circus Smirkus. What a way to kick off my sixtieth birthday! Fun! I like to way you have a long celebration – like my sister who spent the whole year and beyond celebrating her 60th. I think your sister outdoes us 😉 I have a few special events planned for my 60th—lobster roll with a friend, family coming in September, and perhaps going to the play “Peter and the Star Catcher” at the Theater at Monmouth. Nothing elaborate, but very enjoyable. So much fun! You would have loved it. Oh, me too! Guilt-free enjoyment. Those kids are certainly there because they want to be there. Good for you! Celebrate, celebrate! Enjoy this milestone celebration, Laurie! How nice to celebrate in stages! These birthdays with a nought on the end are a bit daunting, so easing into a new decade with pleasurable outings accompanied by friends and family are just the thing! A classmate of my son’s used to go to their camp every summer and really loved it. So much fun! Those kids are amazing. Wow, this sounds like and great event and on one that I did not know about.. Thank for sharing this and I will look forward to hearing about your continued celebration. I’ll even add a blueberry cake. Keep it in mind for Piper. In a couple of years, she’d be the perfect age. And blueberry cake!!!! Boy oh boy! Good way to celebrate, and great pics! Happy birthday! I’m a firm believer in celebrate early and often and have a wonderful month celebrating your birthday! 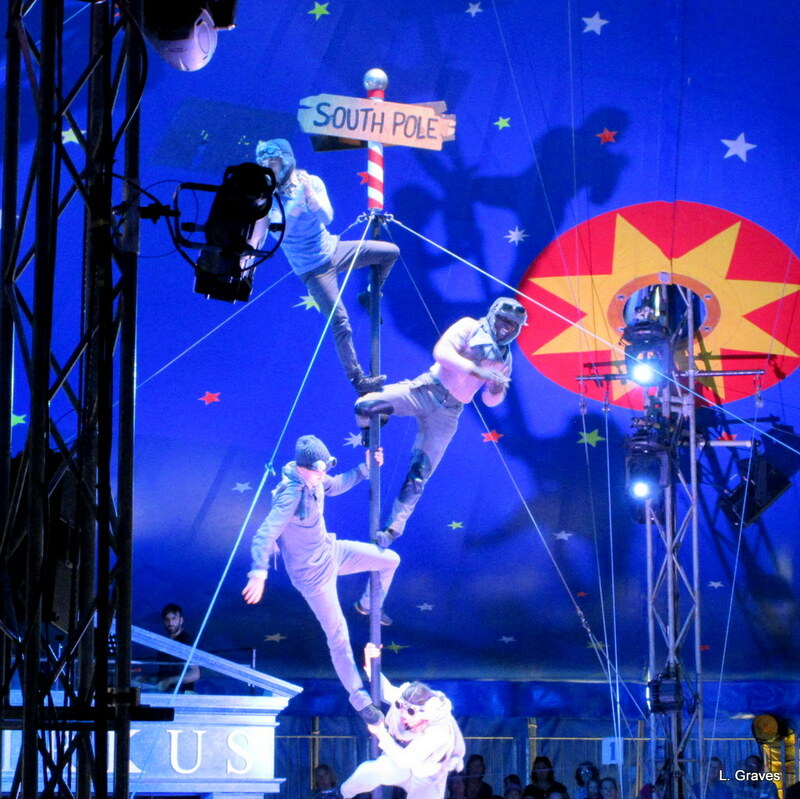 Great photos and thanks for introducing me to Circus Smirkus.